Whether looking for the most immersive viewing experience or a great productivity monitor we have the best ultrawide monitor for you. Ultrawide monitors offer an unparalleled level of immersion when it comes to watching movies or playing video games. Filling your peripheral vision with whatever it is you’re looking at makes you feel truly engrossed in it. Ultrawide monitors are also excellent for getting work done thanks to their extra screen real estate. If you’re looking for the best ultrawide monitor, whether you need it for work or play, then take a look at our reviews and guide below. We’re certain one of the options covered in our reviews will suit your needs. One of the biggest appeals of curved monitors is their ability to offer a more immersive gaming or movie watching experience. No monitor comes even close to delivering this immersive experience as well as the Samsung CHG90. The CHG90 is arguably the best curved monitor on our list for those who do a lot of gaming thanks to its incredibly responsive performance. The panel has a 1ms response time and a 144Hz refresh rate meaning on screen movement looks buttery smooth even at very high speeds. Games at high refresh rates look sharper and more clear than when played at lower frame rates. This is also the widest widescreen monitor, coming in at an impressive 49-inches with a unique 32:9 aspect ratio. On top of the incredible size, this monitor boasts Samsung’s unique QLED technology that allows it to produce vibrant colors that really pop. This is not to be confused with OLED, however, and does not have the rich blacks that OLED has. Unfortunately, while this panel has incredible color production and excellent responsiveness for gaming, it does have a major weakness: it only has a 1080p resolution, meaning it won’t be quite as sharp as some of the 1440p options on our list. While 1080p is arguably better for most gamers since you’ll be able to achieve higher frame rates and smoother motion at lower resolutions, that’s a tough pill to swallow when you’re throwing a grand down. Nowadays, the best gaming computers don’t just run at 1080p and they don’t cap out at 30 or even 60fps. If you’re the proud owner of a computer like this, then you’re probably looking for something to actually put it to good use with. 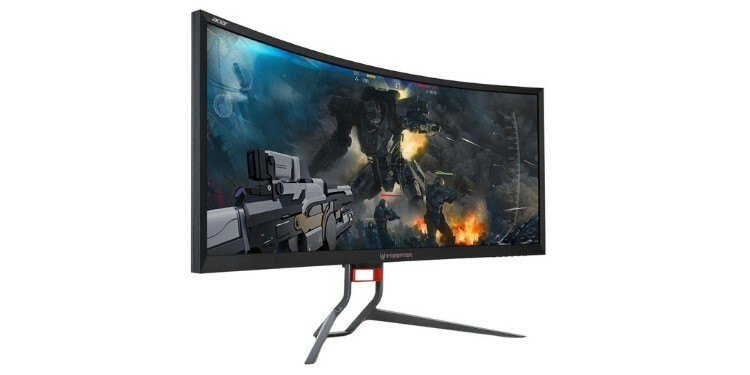 The Acer Predator Z35P is an excellent 3440x1440 monitor for gamers who are ready for a higher resolution. 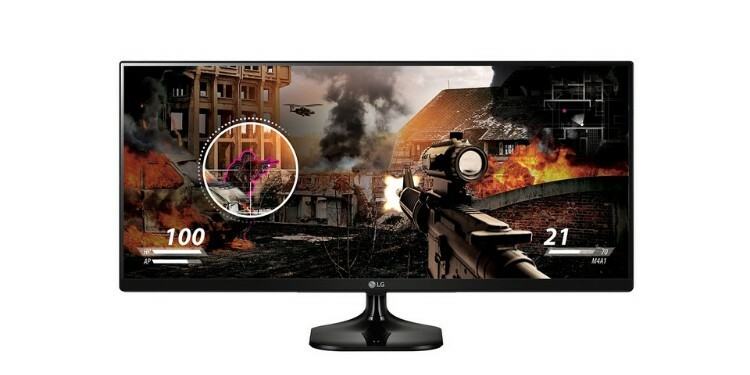 This 1440p ultrawide monitor comes in at 35-inches with a 21:9 aspect ratio. The VA panel has a 4ms response time and a refresh rate of 100Hz. However, you can actually overclock the monitor in the settings and have it run at 120Hz which looks amazing at 1440p if your PC has the power to run games this fast. The Acer Predator also comes with a pair of built-in speakers. These speakers run at 9 watts each meaning they aren’t the most powerful speakers but the sound is passable. However, if you’re looking for clear audio a pair of gaming headphones will provide a much better experience. This monitor’s major weakness is its color accuracy. Colors look fine overall, but this monitor does not cover nearly enough of any color gamut reliably enough to be used for color sensitive work. If you’re the gamer by night and photo or video editor by day type, then this is not the monitor for you. If you’re not a gamer, then the idea of refresh rates well over 100 Hz might sound like a foreign concept. Some movies, such as The Hobbit franchise, are filmed at 60fps, but most movies run around at 30fps so such high refresh rates are unnecessary for movie or TV watching, but there are other features that would be preferred for such a task. This was the cornerstone of the design philosophy behind the Dell U3417W. For starters, Dell ditched the higher refresh rates seen on many curved monitors and went with a meager 60Hz. 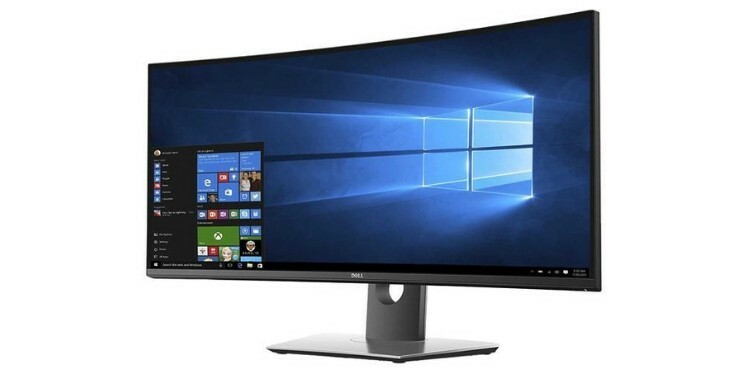 Dell also gave this 21:9 monitor a slightly more modest curvature than most ultrawide monitors of 1900R (as opposed to the more standard 1800R which we’ll look at in more detail shortly). The slightly flatter screen gives less of a “wrap around” immersive effect but is better for showing movies and other content since these are generally made for a flat screen. To improve the quality of the content you’re watching Dell factory calibrates every unit to cover 99% of the sRGB color gamut which is enough to be considered very good color. There are also a pair of pretty decent built-in speakers inside the monitor. Finally, the monitor is impressively adjustable on the included stand making it easy to reach a comfortable viewing position. While one of the major draws of ultrawide monitors is their potential for offering immersive gaming and viewing experiences, they are also excellent tools for productivity. The LG 29UM68-P is designed to take full advantage of this fact and is packed with productivity optimizing features. For starters, the panel has over a 99% coverage of the sRGB color gamut, which is enough to make this a suitable work monitor even for photo or video editing. What truly makes this stand out as a productivity focused monitor though are the excellent menus and split screen capability. The onscreen menus make it easy to adjust the monitor to your liking and to set up split-screen mode. Split screen mode lets you divide up the widescreen monitor into effectively multiple monitors in 14 different ways allowing you to have different windows laid out in different positions all over the screen. Moving on to the weaker points of this monitor, it only uses a 1080p resolution and sports a meager refresh rate of 75Hz. Also, it is a flat widescreen rather than curved. That being said, this monitor still performs well when gaming thanks to its “black stabilizer” feature that helps show objects in dark scenes better. Moreover, it is the first monitor on our list that even approaches being “affordable”. If you’re paying close attention, then you’ve probably already noticed that this monitor is very similar in specs to the last LG monitor we just looked at, and you’d be correct. 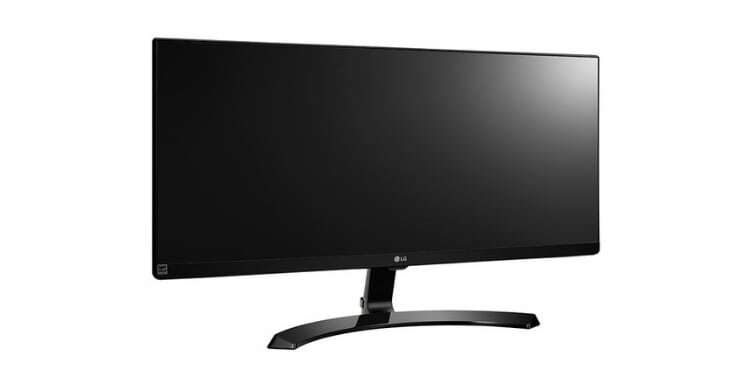 The LG 25UM58-P is essentially the little brother to the monitor we just checked out. It features the same 1080p resolution and 75Hz refresh rate as the previous monitor we looked at, as well as the same 21:9 aspect ratio. The major difference is that this monitor comes in at a whole four inches smaller with only a 25” screen size. That being said, these four inches cut the cost of the monitor by more than half. This simple cost reduction of making the monitor slightly smaller makes this by far the most affordable monitor on our list. If you’re looking for a decent ultrawide monitor that won’t break the bank, then this is it. There are an almost innumerable amount of things to consider when comparing monitors. Ultrawide monitors both shrink the possibility space while adding in new factors to consider. Ultrawide monitors come in a variety of sizes, aspect ratios, and curvatures. On top of this, each one has different color production, resolution, and refresh rate. To help ensure you are making the right choice when shopping for an ultrawide monitor let’s take a look at some of the most important things to look for when shopping. The first thing most people look at when shopping for any new monitor or TV is the resolution. The ultrawide resolutions are actually just like resolutions on any other monitor (yeah, it’s weird since resolutions are listed in predetermined aspect ratio). Ultrawide monitors on our list come in two resolutions: 1080p and 1440p. 1080p has been around for years and is the resolution familiar to most people. 1440p is a more recent category and is, as one might expect, in between 1080p and the incredibly sharp 4k resolution. For those who plan to use their monitor for gaming, there is a completely legitimate argument to be made for lower resolution monitors. Most gaming PCs can run games easily at 1080p and can even run them at very high frame rates. On the other hand, 1440p games are much more difficult for most systems to run, and you won’t be able to achieve the same refresh rates as in 1080p. So, if you’re interested in 1440p, you should either expect to sacrifice some FPS, or to buy a monster rig that could push you to high FPS at that resolution. Another closely related specification to keep an eye on is pixels per inch, or PPI. While two monitors can be the exact same resolution, depending on their sizes relative to each other, one might have a higher density of pixels. A smaller screen at the same resolution as a larger one will actually appear sharper from close up, because it will have a higher PPI (as can be seen on the 29-inch LG 29UM68 compared to the LG 25UM58). 80 is a generally acceptable PPI, but anything around 100 should look really sharp. If you’re looking for a 4K ultrawide monitor, there actually aren’t any quite yet. But you can do the next best thing by getting an ultrawide that has a high PPI for a crisper image. When it comes to screens there are generally three types of panels. For starters there are twisted nematic, or TN panels. These are generally inexpensive to manufacture but have poor color quality and narrow viewing angles. None of the monitors on our list use this kind of panel. Moving up the scale are the vertical alignment, or VA panels. These panels have much better color production than TN panels, but still suffer in some cases from poor viewing angles. The Samsung QLED at the top of our list is in fact a VA panel at heart, but it uses quantum dots that are literally what they sound like, very small light emitting particles, to produce even more vibrant color. Finally, there are in plane switching, or IPS displays. These displays are generally considered to be the most color accurate and have excellent viewing angles, but generally run at lower frame rates. The refresh rate is an incredibly important spec to keep an eye on for gamers. Your refresh rate is effectively the highest possible FPS that monitor is capable of displaying. So, if you were pushing 140+ FPS in Fortnite, but you only had a 60 Hz monitor, then it would only display 60 FPS. Higher refresh rates offer smoother looking motion, especially when things on screen are moving by quickly. In things like racing games or fast-paced shooters, having a high refresh rate can have a huge impact on the experience. Higher refresh rates are also ideal in competitive games because you’ll literally be able to see things happen more quickly and with greater precision than a lower refresh rate monitor. The Samsung CHG90 is easily the best monitor on our list in this regard with its 144Hz refresh rate. Color gamut is a term very few people will be familiar with, but it is a good thing to be aware of. Color gamut is a term that effectively gives a quantitative value to how good a given monitor is at producing color. The standard “color space” used for measuring this is the sRGB color space, but there are even more demanding color spaces including the Adobe RGB gamut. 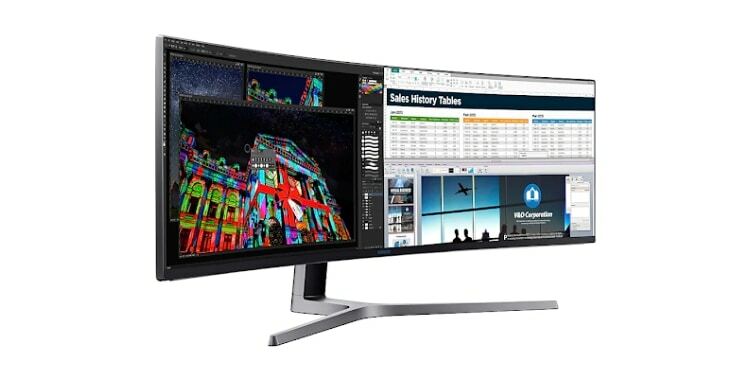 While 99% or more coverage of the sRGB gamut is considered good color, monitors like the Samsung CHG90 can reach well outside of the bounds of the sRGB color gamut. This is important for those looking for a nice viewing experience while watching Netflix, but is even more important if you do a lot of photo or video editing. Having accurate color production will prevent you from working on something on one monitor, then having it look completely different on another. Many of the monitors on this list are not only ultrawide but also curved. This curvature helps the monitor to fill even more of your peripheral vision and creates an incredibly immersive environment for enjoying all kinds of content. You’ll usually see the curvature of TVs and monitors denoted with something like 1800R. This is a measurement in millimeters of the radius of the circle formed by the curvature of a given monitor. All of the curved screens on this list are 1800R curvature except for the Dell U3417W which has a slightly more modest 1900R. This means that you should not sit further than 1.8 or 1.9 meters from the screen or the curvature will become less of an immersion builder and more of an annoyance. Curved monitors have also been shown in studies to be better ergonomically for the human eye. Eyestrain and eye ache are significantly more common on flat monitors than curved ones, making them great for long working or gaming sessions.